The warmer it gets, the less I cook. At some point in the summer, all of our meals tend to take on a snacky, party-like feel where normal entrees and appetizers are replaced with elaborate cheese and charcuterie boards, platters of room temperature roasted vegetables, and enormous salads. Everything becomes a mix of sweet and salty as I pull in seasonal fruit, nuts, pickles, and other tasty bits to pair with chilled wine and lazy evenings. 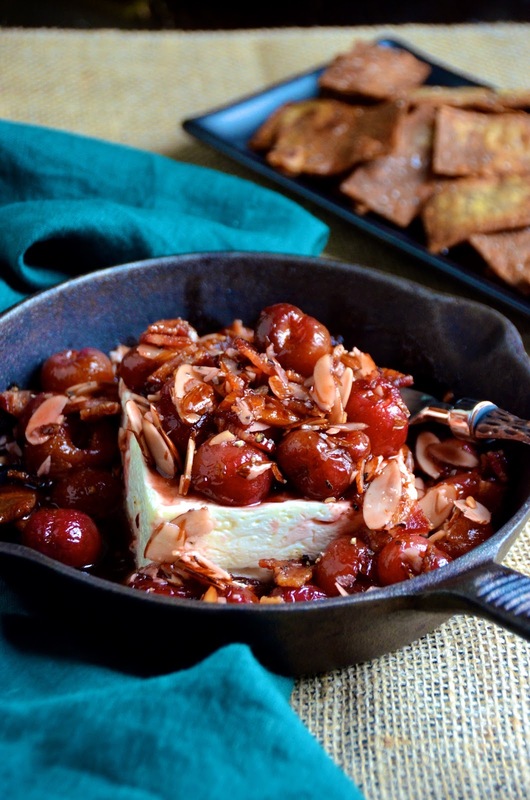 This Baked Feta with Cherry, Bacon & Almonds is the sort of thing I would put effort into if feeling particularly motivated. 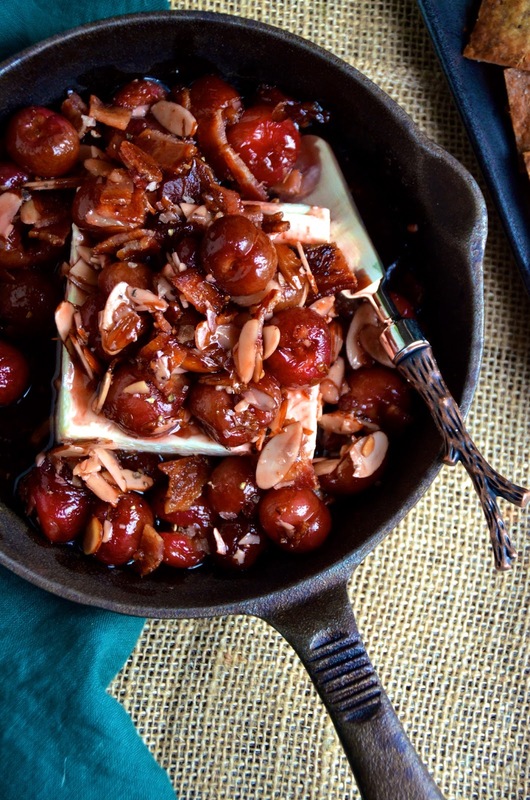 A block of salty feta is baked under a savory-sweet topping made from honey, fresh cherries, sliced almonds, and chopped bacon. Serve with a loaf of crusty bread and enjoy the way it hits all the right notes. This one is perfect for entertaining, whether it's just a quiet date night at home or a feast with friends. You can make and eat this right away, or prepare the topping and then wait until just before your guests arrive to bake with the feta. Preheat oven to 400 degrees. Cook the bacon until crisp, then use a knife to chop coarsely. Set aside. 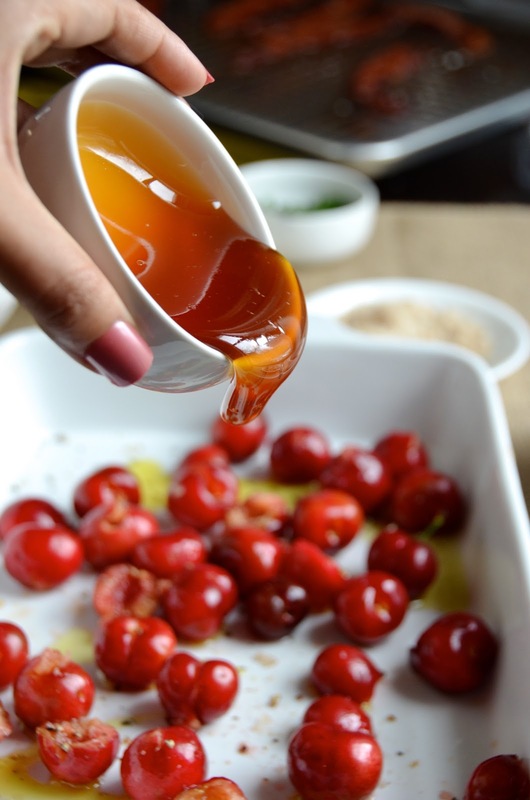 Combine the cherries, olive oil, honey, and almonds on a baking sheet or medium baking pan, tossing to coat well and spreading out into a single layer. Bake 15- 20 minutes, or until the cherries soften and start to release their juices. Place the feta in a small oven-to-table baking dish or skillet. Add the bacon to the cooked cherry mixture and pour over and around the feta.